stall chart for cleaning stall made by Maritza K. for her family to use when cleaning stalls. The one bedding mentioned that I have not tried was peat. I especially appreciated Maritza K. for posting about her family helping and how she had to figure out a way “to ensure we were all being equally thorough” which included her making a stall chart. I believe that this is probably why the university ‘taught’ us how to clean stalls. 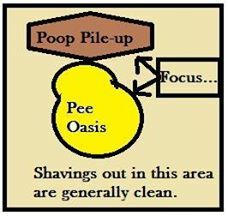 I know it is the reason that I have used a clear teaching method with my boys, who are not as naturally obsessed with stall cleaning. If the stall needs to be stripped, that doesn’t take much training. But if the stall needs to be sorted through I found it was easier to teach them a method such as piling it all in the middle. I am actually going to try the more modern ‘throw it against the wall’ method the next time my horses are inside! Cheryl H. shared this stall cleaning video; WARNING: If you are paying your kids to clean the stalls, don’t let them watch this video! My boys saw a demo of the ‘electric manure fork’ in the video below and it took MONTHS for them to stop asking for one every time they cleaned stalls! I’m guessing that the fork, at $54.95 is likely much less expensive than the European model below it. If you are obsessed with stall cleaning…prepare to enjoy watching the following videos! These all deal with the nuggets… but what about the pee puddles??? Or don’t these horses pee in their stalls??? So…. Did anyone else notice there are no wet spots in either video? What is this magical breed that doesn’t urinate? OMG, these are making me laugh! I like the second one, it looks more fun haha! I loved my stall shifter and miss it every day. It made cleaning 22+ stalls in the barn I was managing much easier, reduced time, waste, and helped those who aren’t skilled with sifting. The machine paid for itself in less than 4 months. Stalls were bedded deeper, flies were reduced (sifts out anything the size of a dime or bigger), Mt Poo-poo was replaced with a dumpster removal system, which gave me 2 extra pastures to rotate through.